So today I finished installing the drawers all five of them... Below are the steps I took to install them. 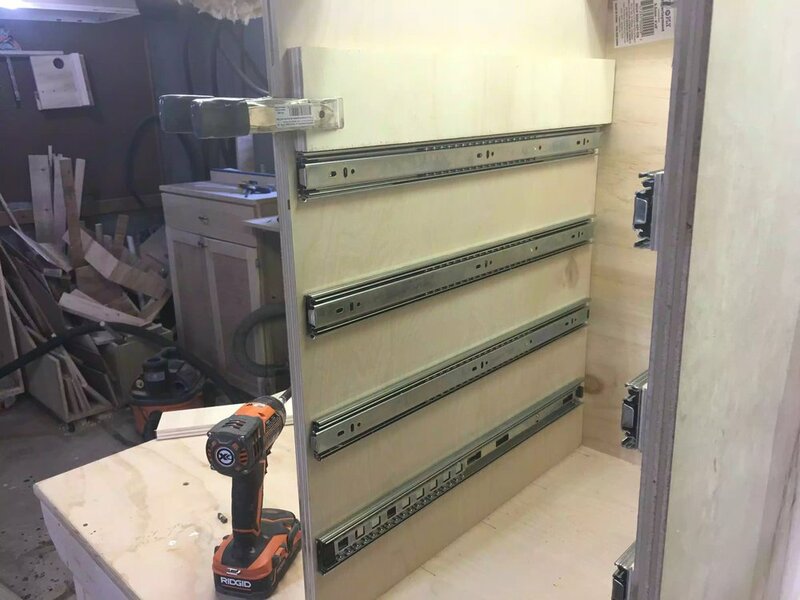 I am using full extension drawer slides and like any drawer slide they have two parts, one part goes into the cabinet and the other part attaches to the drawer. In order to make sure that the drawer slides are alighned on both sides of the cabinet I needed to use a spacer block so as that the both sides of the drawer were patrallel with each other otherwise the drawer would not go in. Since I already installed the lower drawer I started working on the right side of the cabinet, which meant I needed to place the spacer block on top of the last drawer slide I attached and placed the drawer slides one after the other in this way, the pictures below will demonstrate what I did. Here you can see the spacer block sitting on top of the previously installed drawer slide, with the spacer clamped i put the next drawer slide on top of the spacer, I did this 2 more times until all the drawer slides were in place on the left side. I needed to repeat what I did on the left side, what I just did on the right using the spacer block to make sure both sides of the cabinet were parallel with each other, otherwise the drawer would not line up with the drawer slides. Here is the left side of the cabinet, I just needed to add one more drawer slide. Now that all drawer slides were attached to the cabinet it was time to attach them to the drawers themselves, so to do this I put a 3/4" thick spacer strip on top of the last drawer that was previously installed and laid the 3/4" thick spacer on top and then placed the next drawer ... I am using a 3/4' spacer to allow room for me to add the false fronts later. While the drawer was sitting on the spacer block i pulled the drawer out and attached 2 of 3 screws to attach the drawer to the slides, I later pulled out the drawer all the way to put the final 3rd screw at the back of the drawer. I used this method all the way up the cabinet until the top drawer was installed. Here you can see the spacer sandwiched between the two drawers. The previous step completed me attaching the drawers to the cabinet and they work awesome I really like the full extension slides as they allow you access to the whole 22" length of the drawer. Below are some pictures of the installed drawers. Here is the right side of the cabinet with all five drawers attached. Finally here is the front of the cabinet, I will be adding false fronts to hide the pocket hole screws and it will also add that nice finished look to the cart.